At some point since arriving at college, when I was trying to decide whether something was worth the time, I started quantifying it in term of money (examples follow). This worked pretty well for me: money is easy to quantify, and the thought of spending money is something I’m naturally averse to. The most noticeable effect was that it made me a lot more conscious of wasted time. Roughly, I estimate that my time is worth about $30 an hour to me — I can get a $20/hour job without too much trouble, but I imagine that there would be things I’d rather do than a $20/hour job. And time is worth strictly more than the earned money — time cannot be saved, stored, or earned back. “I was on Facebook for two hours today” is “I paid $60 to read my Facebook news feed”. “I slept in until 1PM today” is “I paid $150 to avoid getting out of bed” (assuming one can wake up at 8AM and still function). “I spent all of today procrastinating on work” is “I just wasted $300” (10 waking hours). Things on the left side are things I overhear all the time at lunch in the freshman dining hall. I’ll bet the right side is something that no one would feel comfortable saying. We’re so used to spending time we forget how valuable it is! And people think I’m weird for waking up early. Who wouldn’t wake up an extra couple hours early if they got paid $60 to do so? Or more negatively: would you still press snooze if it cost $60? It’s even more fun to take this and scale up. “I didn’t drop this class even though I didn’t like it” is “I passed up a refund for a $5,000 item I didn’t like”. “I’m not sure what I got out of my last year at college” is “I bought a $100,000 item but I’m not sure what it was”. 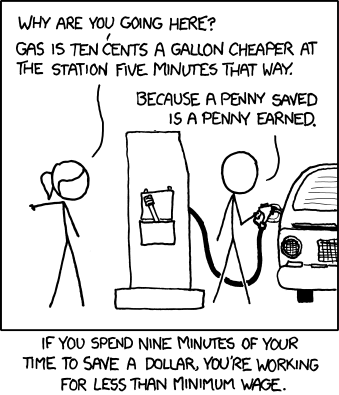 Money is remarkably good at putting things in perspective.